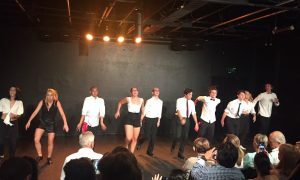 Tap dancing is where it all began for the talented Adam Garcia. With his first big break on London’s West End performing in the acclaimed Australian musical Hot Shoe Shuffle, Adam has since gone on to achieve success not only on stage but also in film and television. 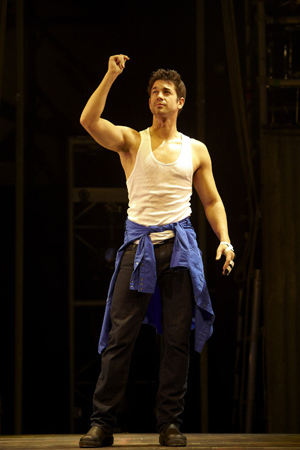 Garcia showed off his hot dance moves in the movie Coyote Ugly, created the lead role of Fiyero in the hit musical Wicked, was a dance teacher in the drama Britannia High, and most recently appeared alongside Kimberly Wyatt (former Pussycat Doll) and Ashley Banjo (Hip Hop crew Diversity) as a judge on UK’s popular television show Got To Dance. Ready to return to his roots, Adam is hitting the West End stage but this time in Blundstone Boots, leading the cast of Tap Dogs. In rehearsals on the eve of their upcoming UK and Australian tour, I got a behind-the-scenes preview of Adam in action. Not only does he bring his own charm and humour to the show, I was amazed at the footwork of this highly skilled tap technician. 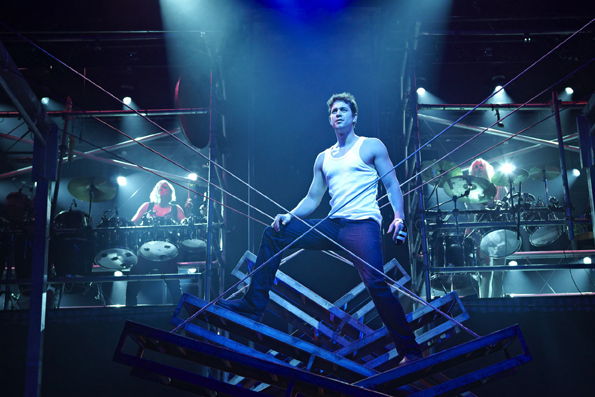 Intrigued to learn more, I caught up with Adam Garcia in between his busy rehearsal schedule. How did you start Tap Dancing? I started doing ballet from about the age of seven for no particular reason, other than my friend Morgan O’Neil asked me to come with him to his dance class. The class was a bit too far away and he left and I wanted to continue, so I went to my cousin’s dance school which was Dumbrell Academy (now Capital Dance). Glenn and Kerrie Dumbrell’s strong point was tap. I did ballet and jazz, and everyone did tap, so I started doing tap dancing. I didn’t ever think I’d be a career dancer. I simply did it because I enjoyed it as a hobby. When I was 15 or 16 I started getting jobs, but I still never thought that this would be a career, even when I went to London with Hot Shoe Shuffle. Hot Shoe Shuffle was supposed to be a six month deferment from university and it turned into a year and a half. Then in London, I thought I probably wouldn’t get another job, I’d just backpack for a year and come back to Australia, but I ended up getting more work and so it sort of developed. 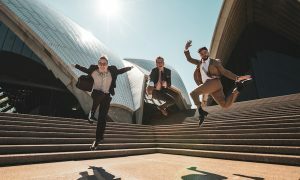 So do you think Aussie dancers need to move overseas for a career in dance? Not necessarily. There are more opportunities over there, but equally there are good opportunities in Australia. Obviously the pool of jobs is much bigger in Europe or even America, but as the percentage of jobs increase, the percentage of people competing for them increases as well, so it’s never going to be easy. You have to be on top of your game! Is it true that this is your first season of Tap Dogs? It is! I’ve never done Tap Dogs, so I’m not officially a Tap Dog until it opens. What is it like to be once again working with Dein Perry (Tap Dogs Creator/Choreographer) since working together in the musical Hot Shoe Shuffle and the film Bootmen? I grew up with Dein and he was a mentor of mine. My first big experiences in my life away from home were with Dein. He was a real father figure to me and we’ve been very good friends ever since. It was kind of odd, as I didn’t know how we were going to operate again, but we just know how each other works and we found it really easy, so it’s a delight. 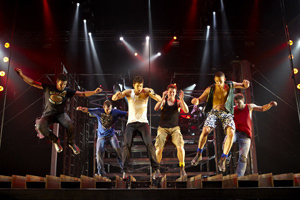 How did you get ready for this role in Tap Dogs? I hadn’t been tap dancing a great deal, so I had an extra two weeks tapping in London before starting rehearsals in Sydney. You need fast feet for this show and I thought “Oh my, are my feet going to be ready at all?” But they seemed to have mostly come good. I did a fair bit of fitness work when I was in Los Angeles – lots of sprint training and a bit of muscle work. I played football two or three times a week and one of those games was a 90 minute full field soccer match. You’re constantly sprinting and never stop, and so it’s kind of the equivalent to doing an 80 minute show. It’s certainly challenging, but I’m getting there. How important do you think Tap Dogs is to championing the art form of Tap around the world? I think it is incredibly important, and not because I’m intimately attached to the show. There aren’t tap shows of this nature that are still continuing today. There are ballet companies and contemporary companies and their expression and narrative is done through dance. Tap shows don’t exist like that. Savion Glover obviously has his shows, but then there’s 42nd Street and musicals where suddenly there is some tap dancing and then it ends. There is not a show that I have seen that is just a tap show, and that’s all it is. Tap Dogs is really the only one on an international scale. There’s no speaking, its music and tap for 80 minutes and that’s that! The Tap Dogs trademark is the Blundstone Boots. Was there a need to adjust your tapping style for these shoes? Actually in London when I was starting rehearsals I knew I needed to get some boots on because they are a lot heavier than tap shoes. I dug around in my cupboard and found the first boots we wore for the original Tap short for ABC TV (this short film launched what was to become the Tap Dogs and the concept of tapping in Blundstone boots). It takes a lot more deliberate dexterity to make the sounds. I had to remember how to use them, and it took about a week and a half to get really used to the boots. Definitely the Sydney Olympics Opening Ceremony (Adam led over 1000 tap dancers performing to a global audience), and opening in the musical Saturday Night Fever in London (Adam played the lead role of Tony Manero). Even just opening in Hot Shoe Shuffle was kind of weird and crazy back in 1992. I had no idea about openings and I didn’t realise it was such a big deal. I even asked Dein if I could have it off as I had tickets to the Red Hot Chili Peppers concert and they were only playing one gig. We had another 30 shows after that and I couldn’t see what the big deal was! You’ve been a judge on the successful UK reality television show, Got To Dance. What qualities do you believe make a great dancer? Obviously feet are pretty important, and musicality. Musicality is not only about keeping time and doing the choreography, but it’s feeling the music and where moves should be. I think dancers learn that music carries with it an inherent rhythm, tone, style and nuance and that’s why people have different styles. They hear the music differently or feel the dance moves in a different way. When people really explore and give into what they feel and express it through the music, it makes a good dancer and a very watchable dancer. The ability to let go is very important. There was a 10 year old boy on the show who is autistic and literally the music moved him and that’s the only way I could describe it. He just stood there and the music went, and he just went. That was one of the most beautiful things in the show. Do you see yourself as an actor or a dancer? Even though I’ve got acting, dancing always reels me back and I realise “oh yeah, you’re a dancer – deal with it”. For all my protestation about being an actor, people recognise me as a dancer, so I don’t look a gift horse in the mouth. I love making movies, I like making TV, I love doing live theatre, I love doing musical theatre, I like doing dance shows and I like being a judge, so I’m just trying to do as much as I can. What are your future plans after Tap Dogs? A new season of Got to Dance (UK) starts at the end of the year so I’m excited about that. Chris Horsey (Tap Works Director) and I have been working on a show which we’re about half way through choreographing. He’s got his tap company up and running and we’ve got ambitions to complete the show and put it on stage finally, that’ll be nice!